Glassmaking dates back some 3500 years to early Mesopotamia, the tradition growing and improving with techniques and tools of ancient Egyptian and Phoenician artisans. Blowpipes were used later in Rome, and by the 16th century, fine, clear blown glass vessels were being manufactured all over Europe. Glass instruments developed during this time, although in Asia the practice of water-tuning porcelain or glass bowls and striking them with sticks had already been established. In the 1700's the German composer Glück, and an Irishman named Richard Pockritch popularized the use of wet fingers and friction to coax music out of an array of tuned glasses. Skilled glassmakers could also vary the sizes and thickness of cups to sound exact pitches, eliminating the need for tuning water. As it grew in renown, the instrument now referred to as glass harp or 'musical glasses' had a host of names: "Seraphim" (perhaps a reference to the ethereal sound), "Grand Harmonicon," Verillon," even "Angelic Organ." Glass is a superheated and cooled mixture of sand, soda, and lime. It's an extraordinary substance-technically a liquid in suspension. Like the action of a bow to a violin string, the rim of a glass will alternately 'catch and release' from a rubbing finger. As a glass is played it changes its shape, just like a violin string or any other vibrating musical material. A glass does this by expanding and contracting at points along its circumference. The pitch of a glass will go lower with the addition of water because this 'spring' action is slowed. Sign up for Glass Harp News!! Join the mailing list to receive updates. Optionally, in the message body of the email, write which part of the world you are in, and if you’re interested in booking performances, a little about your venue (e.g. school, private event, etc). You will then be notified in case a tour is planned for your area! Otherwise, you will receive general updates and links to new videos, etc. Your email address will never be shared. Jazz standards, Celtic music, and ice cream truck songs! Welcome! Whether you are an educator – or an event planner, or here simply for the pleasure of this unique art, you’ll find everything you need using the navigation at the top of each page. Scroll down for some quick info on the glass harp. CDs are available for purchase on the recordings page. Brien Engel is one such passionate explorer of these rare sounds. 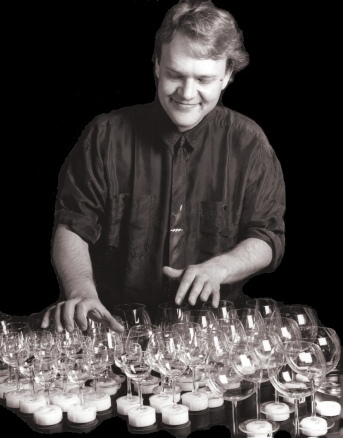 In addition to bringing a unique style and fresh challenges to the glass harp, he offers a full repertoire of music and presentations for all venues. A few of us take the idea into a lifetime of passion and exploration.